We couldn't decide what to do. Our brains seemed to have turned to jelly since landing in Siem Reap. We'd been to Angkor Wat, Pot Pol's Killing Fields, and the markets. Our tuk tuk driver Cheon had some great suggestions but we wanted to do something different too, everywhere we had gone was overrun with tourists and we didn't want to feel like cattle being hurdled along. There was another side of Cambodia that was waiting for us. We met Cheon and asked him to take us to the countryside. As we bumped our way through the rickety, rusty colored road on our way to the rice paddies, he told us about his days growing up in the countryside around Siem Reap. "My family worked in the rice paddies" he said as he looked into the distance. "There is only one harvest a year" his eyes glazed. As we drove slowly past traditional Cambodian houses on route to the rice paddies, life was unfolding in front of our eyes. A woman cycle by with a radiant smile, all the time carrying five huge sacks of rice on the front of her bicycle, not breaking a sweat. Men steered horses and with carts of vegetables attached. Other families were having a siesta to escape the scorching heat, sprawled out on the porch, arms and legs dripping over the edge of their makeshift sleeping quarters. Cows grazed dozily, their chocolate brown eyes not flinching. Gas stops consisted of small racks by the road holding several plastic bottles of petrol and a money tin, for the honest. Children ran to the edge of the road to look, modestly dressed, some naked, waving and smiling, even running after us and shouting "Hello," to induce a further chorus of toothy grins and giggles from their friends. One boy was innocently playing with a frog in the mud but soon lost interest when we came by, the frog, being held by one leg curiously, was cast aside, as he jumped up and down and waved excitedly. 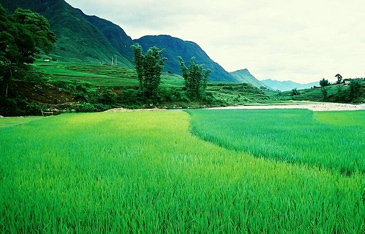 The road opened up into an expanse of vermillion green rice paddies. The cloudless azure blue sky and rusty orange road seemed to amplify it further.People were working in the fields under the laborious sun. They turned and waved, again, smiling. This was a real Cambodian experience not put on by the package tours and was a special one because Cheon was our driver. His knowledge of the area was another insight into the day to day life of people here. We stopped and took some pictures. Cheon asked us where we wanted to go next, "Do you want to go to floating markets?" he said. "Are there many tourists?" we asked "Yes" he laughed. 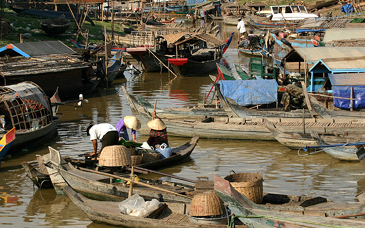 "I'm sure we can live without the floating markets" we said. We turned around and looked one last time at the radiant rice paddies and set off on our bumpy journey back on the dusty road. Just six hours away from Seoul, Siem Reap is fast becoming the destination of choice for many travelers. With an immense history, mix of French and Asian flavor, and some of the friendliest people around, Siem Reap is a fascinating place to visit at any time of the year. 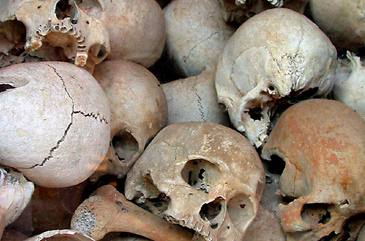 In 1970s millions of Cambodians were killed under the policies of the Khmer Rouge government led by Pol Pot. You cannot get to Siem Reap without paying respects to the many souls that suffered under Pot Pol's brutal regime. As most of us know, Cambodia has an interesting and sad history. At the site of this tragedy, you can see the skulls and bones of the victims including many children and light incense as a form of respect. There is a short gallery of pictures next to the prison camp, including pictures of some of the horrendous tortures that occurred here. This is part of Cambodia's history and has to be experienced. There are many tours on offer or for independent travelers just get a tuk tuk, bike or taxi. Literally translated as Angkor Temple, this World Heritage Site is overwhelming. This maze of Ancient Temples was a lost city and is steeped in history. Highlights are the main Angkor Wat area, which is an architectural wonder. You can climb the steep steps to the top and claim the view for yourself. Inside, ancient Cambodian and Indian influenced bas-relief and inscriptions depicting heaven and hell are ornate and intricate in detail. You will find yourself wondering how long it took to create this amazing temple. Other highlights are the newly restored Bayan Library, and the Buddist temple which is hidden at the end of a track. The Buddhist temple is simply straight out of Indiana Jones, lots of secret passages and mythical ruins and inscriptions. Here there are trees which have grown on rocks – something which is an eyeopener. 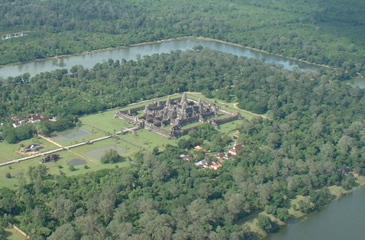 The Angkor Wat site itself is huge and you can chose from a one day pass to a week pass. The one day pass is $20, for the other passes you need a passport photo. Vivid, bold and brash the Old Markets are where you will see real Cambodian life unfold. Weird and wonderful smells and beautiful handmade products including scarves, jewelry, sculptures, incense, fresh herbs and spices – look out for special teas, like ginger and peppermint. Lemongrass is prevalent around here, its cheap, and is used for many things including cooking, tea, and incense, as a natural mosquito repellent and always smells amazing. Cambodians are friendly and will haggle with you but it's always best not to haggle to the last cent. Get your products here, and give money directly to locals. Many hotels offer boutiques but it's always better to buy things locally. Undoubtedly, the coolest kid on the block, FCC is not only a design beauty but promotes thoughtful tourism with some of its environmentally sound policies. Standing for the Foreign Correspondents Club – and it really is one. 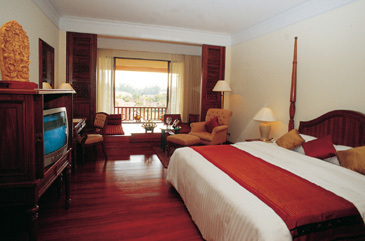 Like a residence not a hotel, FCC's is understated cool style is a fusion of France and Vietnam. Reminiscent of Indiana Jones, in an earthy color scheme of creams, browns and whites, this is the place where journalists hang out and get inspiration. Each room is based on a different herb or spice in which it is scented, some choices are Cardamom, Lemongrass, Mint – the list goes on. 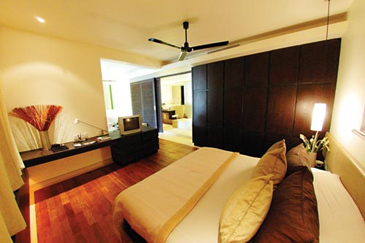 All rooms are sheer simplicity with tones of chocolate brown and cream and French windows and shutters and retro art. The contemporary edge is added with a computer screen television and environmentally sound attitudes in the use of fabrics and water usage. Guests can use the steam room, pool and Jacuzzi free of charge and the Visiyana Spa serves up a wide range of treatments including the spiritual massage. This is an hour of pure heaven, combining Thai techniques with aromatherapy oils in a discreet and tranquil environment amongst the flowers in the tree shaded gardens. The restaurant here is an article in itself, with very reasonably priced modern European and Asian fusion cuisine served in a classical setting. The lazy breakfasts overlooking the cities buzz include such delights as thick, creamy, homemade yogurt scattered with nuts and drizzled with fresh honey, freshly made pain au chocolate and croissants and delicious Khmer porridge, a fragrant clear soup of rice, vegetables, herbs, and chicken or fish, a hearty feast to start the day. For dinner, choices include tasty Cambodian Vegetable Curry, Fish in Curry with Lemongrass, Pork and Beef fillets with Asian style vegetables and even Western classics like homemade cheeseburgers with French fries and club sandwiches. If its decadence all the way you're after, then search no more, welcome to the Sofitel. 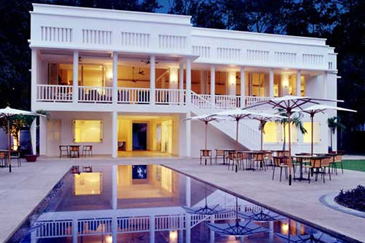 This sprawling mansion tastefully blended into the environs, is the chieftain of luxury hotels in this area. 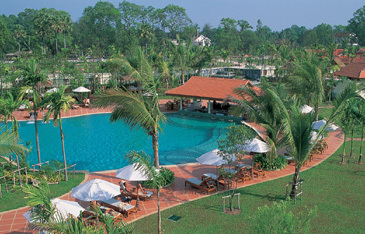 Everything about this hotel screams decadence, including the huge pool outside for lazy days in the sun. Dark woods, cream sheets and tasteful Colonial style architecture add to the beauty of this classic hotel. If you want to live like a princess for a few days, then this is the place to do it. Mahout Dreams, the Khmer/French restaurant is an intricate and romantic setting overlooking the shaded porch. The little details here are its asset, with unique French windows, mosaic tiling, antique candles and ultra efficient service all add to an amazing experience. Khmer food features herbs and spices and the Khmer menu here is particularly delicious, with delightful dishes such as beef skewers on lemongrass, scallop soup, and river fish with herbs. 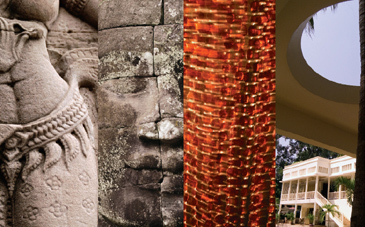 You will need a visa on arrival to Siem Reap. The tourist visa is valid for one month. For this bring a passport photo - the cost is $20. It's a simple procedure but allow and extra half an hour for admistration on arrival.